I was never EVER a goal-setting kind of person… until PowerSheets came into my life. I’ve always loved the idea of goals (and resolutions, and bucket lists, and the like) but never stuck to them or made any sort of game plan that stuck. 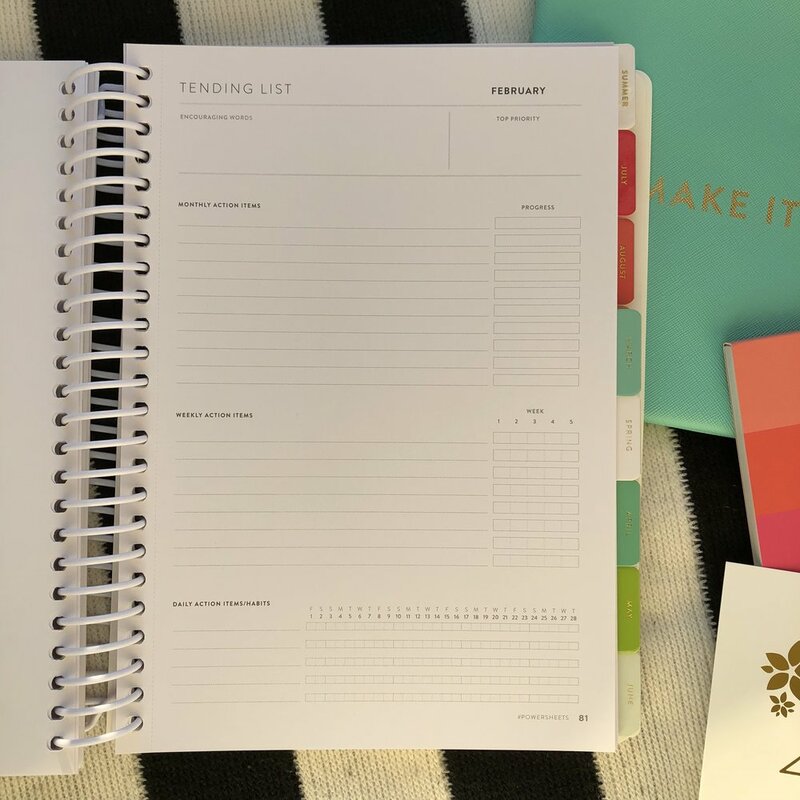 These goal setting planners have helped me be thoughtful and intentional with my goals for the year. And GUESS WHAT?! The 2019 PowerSheets launch TODAY! As of 10 am EST on October 24, 2018, the 2019 PowerSheets shop is open! The prep pages at the beginning are amazing for getting you started, whether you’re a goal setting pro or a total newbie. There are seasonal refreshers throughout the year so you’re never locked into your goals if they need to evolve or change as time goes on. You could set one goal for your year or ten, and then have a guide to walk you through how to break them down into monthly, weekly, and daily goals that are attainable and impactful. It’s all about progress, not perfection! I can’t recommend PowerSheets highly enough, friends. They have been the ONE tool that has helped me make lasting change in my life, and I’m just a forever fan. I’ve ACTUALLY set goals and met them. The prep work pages are incredible at coaching and leading you through how to set good, healthy, smart goals. The community of Cultivators is amazing and a great support system. They’re clear, concise, and helpful. There is intentional preparation AND reflection space. Goals break down into bite size pieces that are actually attainable. Your goals can shift and evolve throughout the year — nothing is limiting or locks you in. 2019: My Word, PowerSheets Goals, Vision Board, Tools, + More! Talking all about my 2019 goals, plans, tools, projects, reading challenges, Bible studies, and MORE! Gratitude, playlists, deals you should know about, a reminder to vote… etc. I was never EVER a goal-setting kind of person… until PowerSheets came into my life. I’ve always loved the idea of goals (and resolutions, and bucket lists, and the like) but never stuck to them or made any sort of game plan that stuck. This Enneagram 1/Type A organization freak LOVES a good paper product, and I wanted to share all the ones I've been loving for a while now. These are the resources I use all year long, breaking things down into monthly goals, weekly plans, and daily habits too. 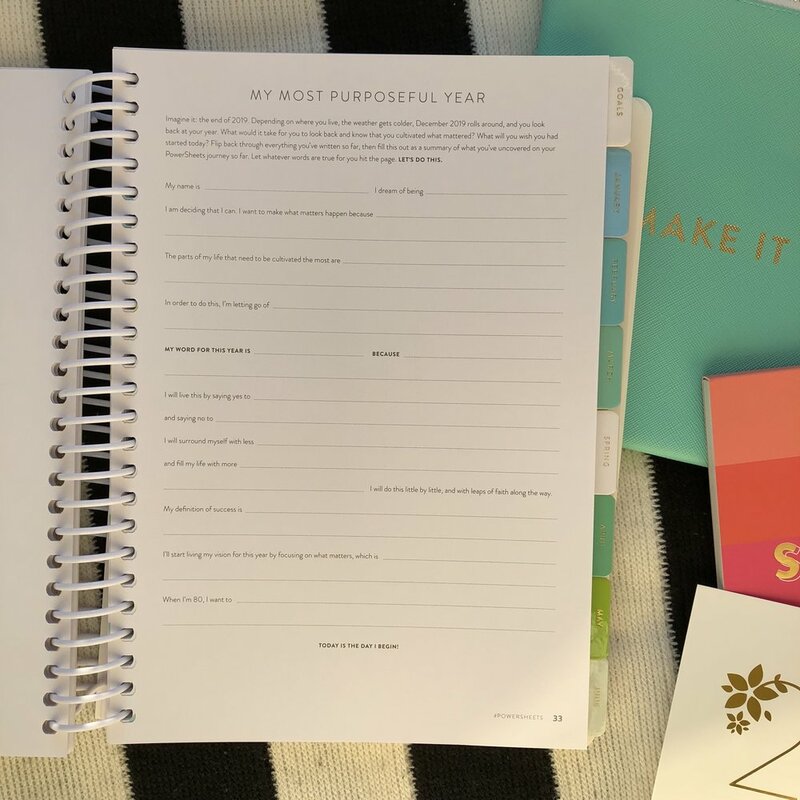 The 2018 Powersheets are available TODAY -- trust me, you're going to want to get your hands on these great intentional goal planners! You know how sometimes you buy something and realize it makes your life SO MUCH BETTER and you never would have known how great things could be had you not had that thing? Can we all just admit we really love seeing what's in other people's bags? Okay, cool. Glad we got that out of the way. Here's mine.